It’s no secret, I love Mexican Food. It’s probably my favorite. I crave it all the time so when I’m dieting it is a huge part of my diet regimen. This Low Carb Mexican Casserole is the perfect for any low carb/keto lifestyle. 1. Brown the 1 pound of ground beef with the small diced onion and minced garlic. 2. Drain the grease and stir in the water and taco seasoning. 3. Let the taco meat simmer on medium heat for about 15 minutes. 4. While the taco meat is simmering, preheat the oven to 350 degrees and spray an 8×8 baking dish with non-stick cooking spray. 5. Once the meat has finished cooking, combine HALF the taco meat with 1 cup of shredded cheese and the diced green onions. 6. Pour the taco mixture into the prepared baking dish and top with 1/2 cup of leftover shredded cheddar cheese. 7. Bake for 15-20 minutes. 8. Remove from the oven and serve with sour cream and salsa. 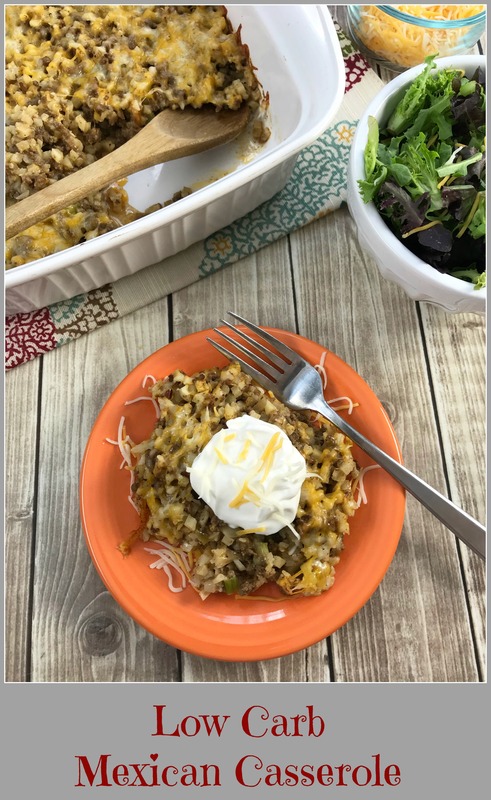 *This recipe is perfect for using up leftover taco meat but if you’d prefer to use the entire pound of taco meat, simply double the casserole ingredients.